what ram do i have? Re: what ram do i have? I thought the Phenom II 965 Black Edition ran at 3.4GHz stock. That's what it's advertised at. man i cant even begin to tell you how much i regret not building this computer my self. Originally Posted by Sean W.
What does the FSB and Multiplier read on CPU-Z? I'd say that's definitely not an ideal overclock. You really want to be looking at running your memory at LEAST at its stock speeds. 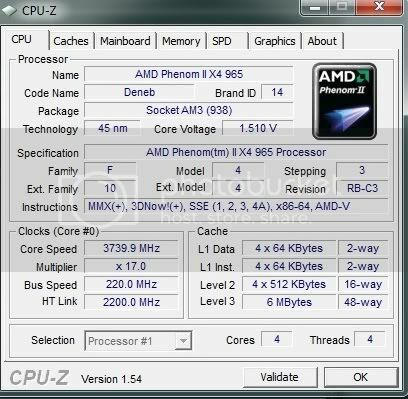 when i go to my computer>properties it says i have an AMD phenom II 965 quad core @ 3.4ghz, is that reading what it is stock or what it is now? so my processor is actually 3.7ghz? why would the guy who built my computer down clock the RAM? so, i can push this CPU harder with out adding anymore energy or heat? check out this thread AMD Overclocking Thread.